Was it an Italian serving pasta dishes etc? 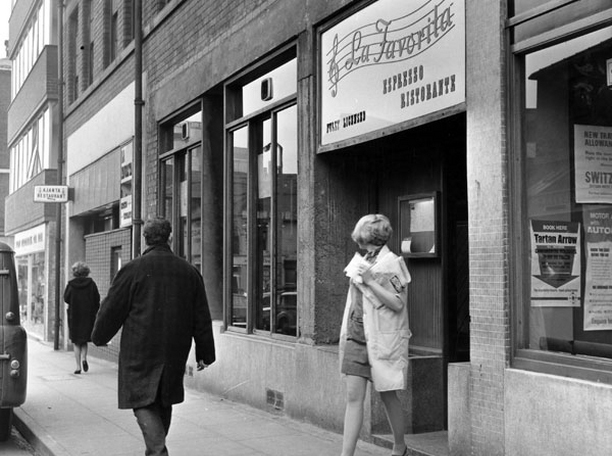 Seems to have been the first Italian Restaurant to to open in the city, according to this study by SCC archives? It also says the first Indian Restaurant, 'The Ajanta' opened in the same year on Attercliffe common, yet the PS image you have of 'La Favorita' has a caption stating they were next door to each other on Carver Street? Also, I'm not sure that Garden Street would have been a prime spot for the first Spanish Restaurant 'El Crofto' in the early 60's? I would imagine it was still very much an industrial area at that time and a bit off the beaten track from the city centre, to capture any passing trade? It also doesn't say where 'The Rickshaw' Chinese restaurant was, so maybe someone will remember? It would be interesting to hear of anyone's memories of any of these 'first' restaurants, or if you have any other stories of restaurants opening before this..... plying us all with their 'world cuisine'. I used to go the the 'Fav' mid sixties, - I recall it more of a coffee bar than a restaurant. Never saw any pasta or pizzas. It was a handy meeting place before going onto city centre clubs and pubs. It was also open after closing time. Inside was trendy sixties decor and a jukebox, probably a bit smarter than the old Sidewalk cafe. It would be packed at times with queue to get in. Nowadays, The Green Room, aerial shot and outside at street level views. Fabulous post about the Rickshaw Restaurant Mr Longden, love the b/w photo, that is pure history. That is the Sheffield I remember having left in 1972. I never went to the Rickshaw Restaurant, in fact, I don't think I went to any restaurant in Sheffield. Wimpeys on Arundel Gate would be the closest I came. I did, however patronise La Favorita once. This would be about 1968/69 when I was hanging out with a group of bikies, we frequented a cafe on Infirmary Road. Kicking out time was too early for some of us to go home and someone said 'Lets go to La Fav, that'll be open.' All I remember is that it was a lot classier than the flea pit we just left. I don't know if they served food, I reckon we would only have bought a mug of tea. I don't think we even drank coffee then and coca-cola hadn't been invented. Not a cafe for bikers THYLACINE ! The Fav was a meeting place for the lads and lasses into the Sheffield Mod scene in the sixties. Had my first glass of red wine in the Rickshaw didn't rate it myself, the wine that is! though some of my pretentious mates thought it was the bee's knees, I'd only just got used to the taste of lager and lime. As for the meal I think i had sweet & sour chicken with fried rice, and a banana fritter for pudding. I have just posted an update on the cupola in the General Chat forum complete with pictures ! View with caution. The La Fav along with the Sidewalk on Chapel Walk were the most popular meeting places for Mods in the 60s, there was often lines of Lambrettas and Vespas outside the La Fav perhaps waiting to go on to the Mojo or the Esquire depending on what day it was. Interests:Allsorts, family,Sheffields history, boats,steam railway, living in the past. La Favorita was a coffee bar whilst I was a regular (1965-66) they did serve meals of which my favourite was beef ghoulash. It was very popular with all types and much favoured by the scooter boys because we could all park opposite on a piece of spare ground. The kitchen staff were mainly asian and I particularly remember Munchi & Paris who were really nice guys. The Ajanta entrance was next next door and dowstairs this was a very nice Indian restaurant frequented by people with a few bob.